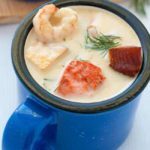 Use this recipe to learn how to make prize-winning seafood chowder using seafood that’s available where you live. Rich and creamy New England style chowder! I had my fill of seafood chowder during our recent trip to Nova Scotia, enjoying bowl after bowl of rich creamy broth full of lobster, scallops and haddock. I couldn’t wait to get home and make my own West Coast chowder. 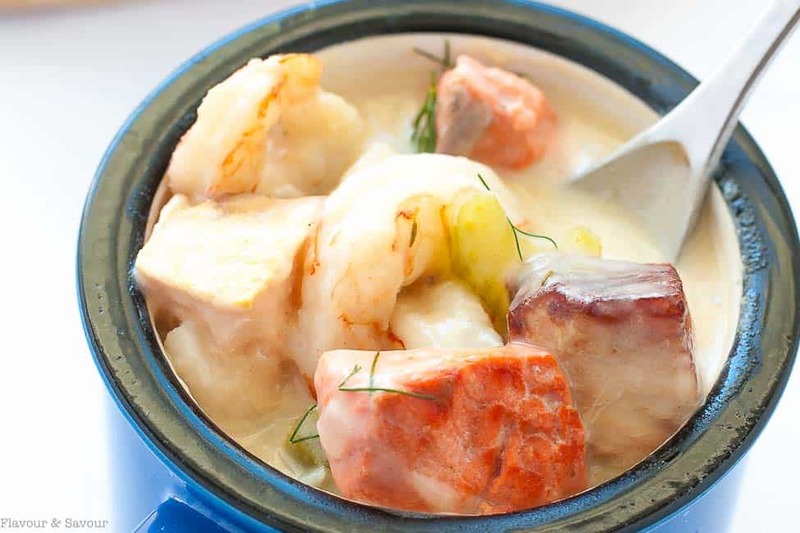 Today I’m sharing my basic guide for how to make prize-winning seafood chowder using seafood that is available where you live. 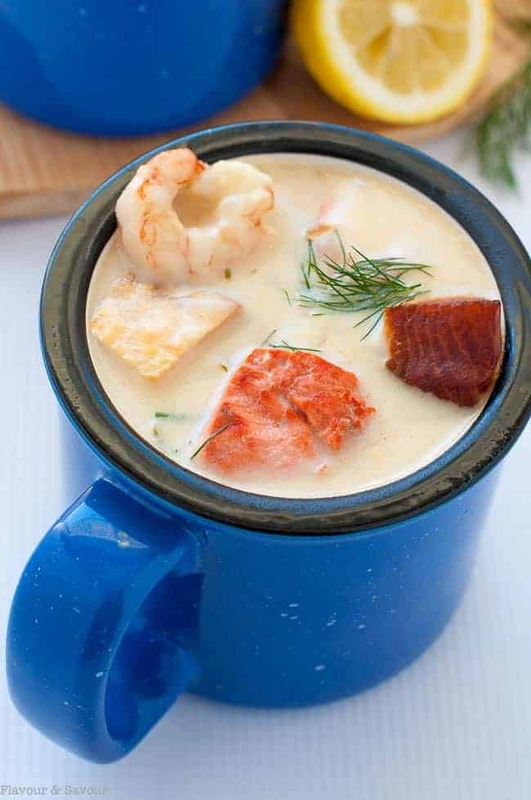 This seafood chowder recipe is one that I’ve made for years. I change it according to the type of fish or seafood I happen to have on hand. While I vary the seafood, some things I never change. I use smoked salmon instead of bacon for flavour so that my pescetarian friends can eat it. I never add clams. 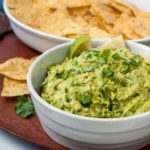 If I use canned clams, there’s a risk they’ll become rubbery, and using fresh clams requires another step to this recipe. I like to keep it easy by simmering it all in one pot, with no extra steps. I don’t over-season it. Chowder should be fairly mild, allowing the natural flavour of the seafood to shine. I load it up with seafood so that, along with a salad, it makes a complete meal. Make a roux in which to cook the potatoes. Add the seafood and seasonings. Stir in the cream, heat gently, garnish and serve. 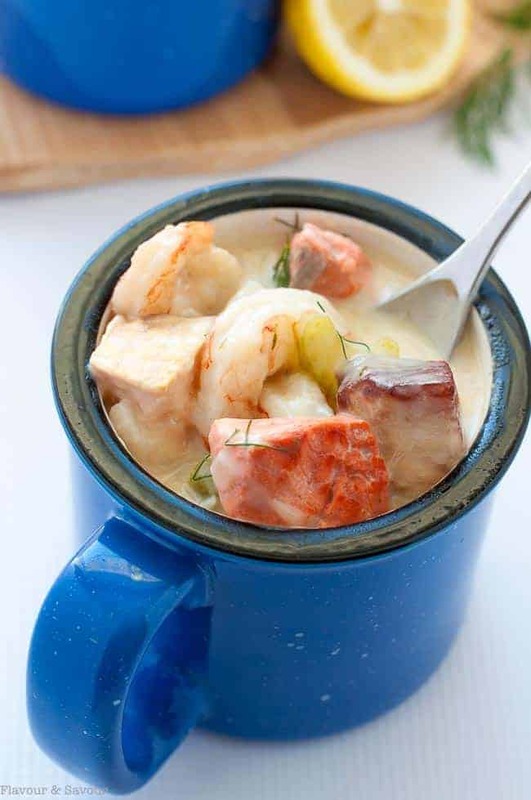 An easy New England style chowder packed full of seafood! I cook the potatoes and optional carrots in this broth until tender, then add the seafood, remembering that small cubes of fish and fresh shrimp and scallops take very little time to cook. 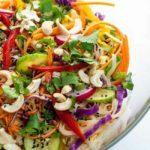 It’s very easy to overcook seafood. There is no option for “well done” when cooking fish, shrimp, or scallops! While some chowder recipes advise cooking the seafood in milk, I like to cook the vegetables and fish in broth, then add the cream just at the end to produce a creamy smooth chowder. Adding it just before serving prevents the cream from curdling and keeps the texture velvety. 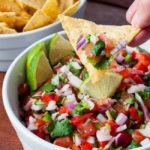 Serve with a crusty loaf of bread and a salad or fresh veggies and dip for a totally satisfying meal! 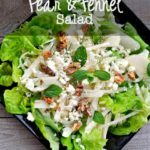 It’s good with this Triple Berry Mixed Green Salad. I hope you find this basic recipe helpful to create your own “prize-winning” chowder, using seafood that’s available where you live! If you make it, let me know in the comments, or snap a pic, post it on Instagram with #flavourandsavour. I’d love to see what you make! 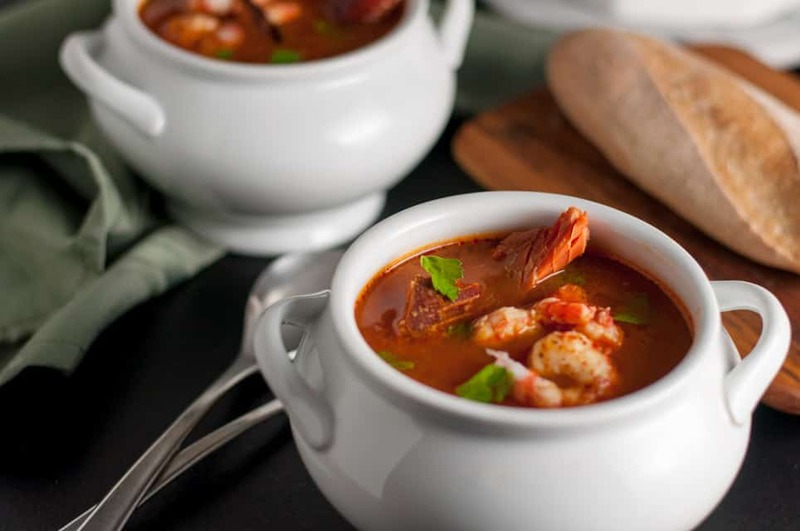 And if you love tomato-based seafood dishes, you might like this San Francisco-style Simple Cioppino that anyone can make. Use this recipe to learn how to make prize-winning seafood chowder using seafood that's available where you live. Rich and creamy New England style chowder! In a large pot or stock pot, heat butter and oil over medium heat. Add the onions and celery and cook until soft and transparent but not browned, about 5 minutes. Stir in the flour, making a roux by adding the broth and the clam nectar. Add the potatoes, carrots, thyme, bay leaf and paprika. Reduce heat to medium, cover, and cook for 15 minutes or until potatoes are tender but not mushy. Add the seafood, wine and seasonings, stir gently and cook uncovered for about 10 minutes. Gently stir in the cream, being careful not to let to boil after this is added. Remove the bay leaf. Garnish with more fresh dill and serve hot. Carrots are optional. Some people like them in a seafood chowder, some don't! Ahhh, memories. As a kid growing up on the island, we had vacations in Parksville where part of the holiday activities was digging for clams. My mom would make a huge batch of chowder, only she called it “bacon soup” or us kids wouldn’t eat it. We didn’t like clams. 😉 Tricky mom. Your chowder pictures brought me right back there. I’ll have to try this recipe for sure. Thanks so much for sharing! Parksville is beautiful spot. We spent many happy days there on the beach, especially when our kids were little. Thanks for sharing your memories, Sharon! I love how simple and clear you make the instructions here! To often chowders are loaded with ingredients. As a chef making a chowder or other creamy soup comes naturally ( I even wrote a post on how to make roux and why I love it! ), but for many this way of cooking/ thickening liquids has become forgotten. 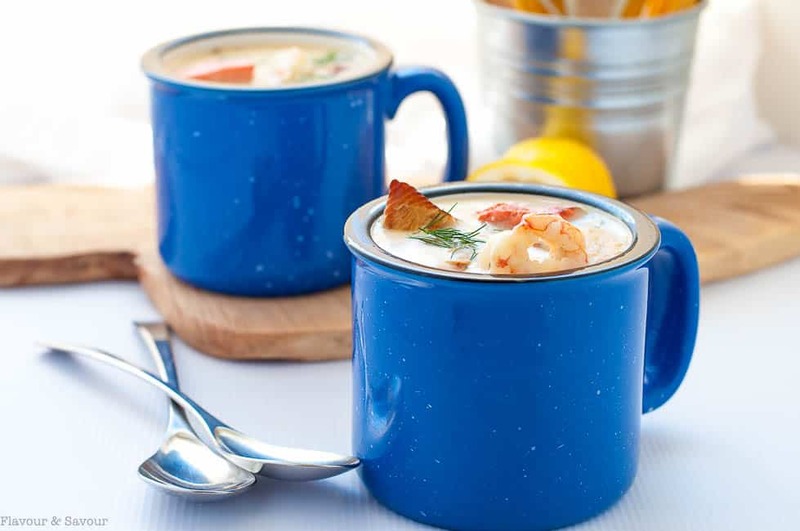 Beautiful pictures, I can’t wait to try your seafood chowder recipe myself! Markus, you’re too kind! Thanks!